This week’s post comes courtesy of Russell Croft, who has kindly allowed us to republish a piece from his blog. The article – on the history of Leeds Bridge House – was researched using resources from our Local and Family History department and is an excellent example of how local history archives can work toward the reclamation of historical memory. The original post can be found on Russell’s website, while further images of Bridge House can be found on our Leodis photographic archive. “I am not the first idler on his way into the Adelphi pub to notice that Leeds Bridge House bears a striking resemblance to the (rather more famous!) 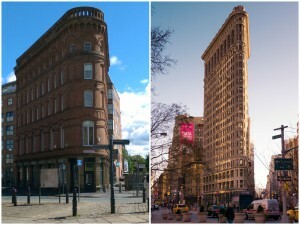 Flatiron Building in New York City, albeit on a more modest scale. Both are wedge-shaped and built in pleasingly Italianate styles on triangular corner sites between busy thoroughfares. The Leeds version is Grade II listed and was completed in 1881, preceding the arrival of its sky-scraping Manhattan counterpart by twenty years. Perhaps the latter’s American architect, Daniel Burnham, paid a covert visit to Yorkshire in search of some old-world inspiration? Perhaps not, but there is an interesting tale to tell about the early years of Leeds Bridge House as a landmark of Victorian moral paternalism. The site for the building, bounded by Hunslet Road, Hunslet Lane and Waterloo Street, was acquired from Leeds Corporation by local banker John James Cousins on 6 October 1879. It was one lot in a general sale by auction of development land south of Leeds Bridge, and it cost him £1,338. Cousins, who lived at Allerton Park, north of the city, was manager of the Exchange and Discount bank on Park Row, and he hired architects Messrs. Adams & Kelly, also of Park Row, to design a building to fit the unusual shape of the plot. The conveyance to Cousins stipulated that the construction was to be at least forty feet in height, and the site invited something out of the ordinary since it is in the centre of one’s eye-line at the south end of Leeds Bridge. The Leeds “People’s Café” was announced open by an advertisement in the Yorkshire Post of 3 September 1881, where it was stressed that its “Breakfasts, Diners, Teas and Suppers of the best quality are supplied at prices within the reach of everyone.” It also offered overnight accommodation in the shape of thirty “excellent bedrooms from 4s per week, or 1s per night,” and “Hot and Cold Private Baths, 3d”. The initial manager was a Mr C. Dilly, who had given way by 1886 to a Mr J. Walker. An impression of their character and facilities comes from a description of a People’s Café newly opened in May 1875 at Whitechapel in London’s East End (this was the second such establishment, the first being in London’s Whitecross Street): “It is bright and cheerful within, and well ventilated. On the ground floor is a good-sized coffee-room, well supplied with little marble-top tables, and upstairs are a reading-room, where also is to be collected a small library, a room where chess, draughts, dominoes, and the like may be played; a room for billiards and also for bagatelle”. It was anticipated that the basement of the Whitechapel café would become an American bowling alley. The scheme’s initial promoters were sure that people would flock “to make use of such places when the places are ready for them”, but the fortunes of the Leeds establishment suggest otherwise. The Leeds Mercury of 26 September 1888 reported that (after only seven years of trading) the business’s name had been altered to the “Cobden Temperance Hotel”. Taken over by the St James’s Hall Committee and “fitted up” on the same plan as the St James’s Hall (presumably the concert hall in the West End of London), it seems that the premises had, in modern parlance, been “rebranded”. These new promoters were reported as expecting it to “prove an equally successful venture” as the St James’s Hall itself, and its reopening was graced with a recital of songs by the Temperance Choral Society performed to an assembly of worthies including the manager of St James’s Hall, Mr A. E. Brayshaw. But such high hopes were soon dashed. By June 1895, the ground floor had been converted into shops and the upper stories had fallen into disuse. Cousins died on 1 December 1897, when the main body of the building was still unoccupied. So it remained in November 1901, when his executors sold it to Nelson & Co Ltd (tea merchants of Louth in Lincolnshire). But the cycle of failure persisted, as that company was put into liquidation by creditors’ petition on 7 February 1905. And however cultured the later Cobden Temperance Hotel may have been, abstaining visitors would surely have preferred to stay at one of several more convenient temperance hotels in the city centre (over twenty are listed as trading there in the 1890s) rather than venturing into a noisy, dirty and probably rough part of town. Nowadays there is virtually no sign of its initial incarnation inside, apart from a dumb-waiter shaft which runs the full height of the building, presumably from what was originally a basement kitchen, with service hatches on each of its five floors. It is currently tenanted by charitable organisations so, in a way, the place has returned to its philanthropic roots. Revised Listed Buildings, City of Leeds, Vol. 2 (The entry for Leeds Bridge House wrongly gives its time of construction as c.1875); West Yorkshire Architects and Architecture, Derek Linstrum, 1978, pp. 370, 379; Leeds The Architectural Heritage, G. Sheeran & I. Beesley, 1993, pp. 40-1; Kelly’s, Post Office andRobinson’s Leeds Street Directories; The Builder, 1874 pp. 225-6, 1875 p. 472, 1881 pp. 676-7; Yorkshire Post and Leeds Mercury for the dates appearing in the text; Jackson’s Guide to Leeds, 1889, p. 207.